This week’s Guild Checkpoint is near to me, because it is my own guild, The Old Timers Guild. This is one of the largest guilds we have had on Guild Checkpoint. That is not bragging, but fact. I have purposely wanted to spotlight the smaller, less know, and community focused guilds in SWTOR. This might appear a huge “steamrolling” guild, but from my experience it has a great community and is more like several smaller guilds all linked together. I know you all don’t want to just listen to me jibber-jabber, so let’s meet Kaeli, the Empire Chapter Officer in the Old Timers Guild. We will get her opinions and thoughts. So let’s set the nav coordinates and get ready for the Jump. How did OTG get its start? How big is OTG, as in number of members and number of games? We have more than 2000+ active members spread across a multitude of games. Currently, we have 11 featured games (which means they have more than 40 active members) and numerous active names (which means they have under 40 active members). OTG is a multi-game guild, how hard is it to be the guild officer with the multiple games and several members? I don’t believe it is any harder to be an officer in OTG than it is in any other guild. We have our leadership broken up by game. For example, we have a chapter for the Empire side and one for the Republic side for Star Wars: The Old Republic (SWTOR). Our chapters are like mini-guilds within OTG. So officers are only responsible for the game chapter they are involved in. Now that we have established OTG’s size, many want to immediately list it as a “zerg” guild. Could you explain what a “zerg” guild is and what steps OTG uses to keep from becoming such a guild? I have never liked the term “zerg guild” when referring to OTG. To me, a zerg guild is all about quantity and nothing about quality. If you are part of OTG, you certainly know that we are all about quality. We may have over 2000 active members, but they are spread out across of lot of games. Each of our gaming chapters is about the size of most other regular guilds. How do you keep things organized as far as raiding, in-game events, and balance pvp/pve needs within the guild? The same way other guilds do. We set up raiding guidelines, in-game events and PVP events through our game chapter officers. What can a new guild member expect when joining OTG? They can expect to make many new friends with similar interests within the guild. Not only do we find our members enjoy playing games together, but they find they have other interests as well from books, movies, geocaching, etc. I am a member of OTG, and I have never felt a lack of community even with the size of the guild. How important is keeping that type of community feeling in the OTG guild? It is our number one priority. No one wants to join a guild that is full of drama so there are a few things we just don’t discuss like politics or religion. Remember, we are all about the fun! Do you personally plan on playing The Old Republic? If so what are you most excited about seeing in the game and what class do you plan on playing first? OTG is one of the larger guilds how do you and your members plan to “stay” together and keep the guild mentality as in the past? We have a lot of tools at our disposal, including our forums and Ventrilo. Our Ventrilo is huge with lots of channels for people to be able to break off and go into. We strongly encourage people to hang out in Ventrilo to get to know others. We have yet to see phase three of the guild system, what things are you hoping to see or even wish might be in this phase or something at release? The cap on guilds of 500 really hurts a guild our size. We currently have 2 Empire guilds and 2 Republic guilds because of the cap. I would love to see the cap removed or at least doubled in size. If the cap can’t be removed or increased, providing an alliance chat channel in-game would help us to communicate between our two same faction guilds. Second on our list would be guild housing/banking. 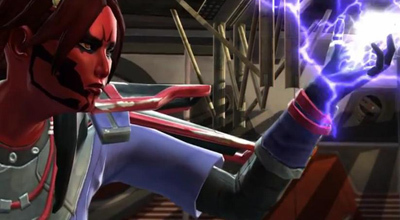 Some of the guilds have not been to keen on the idea of loot containers in SWTOR for operations. Do you think the loot containers are a good idea or should be handled a different way? Personally, I like the idea of loot containers for easy mode operations. With that said, I do hope that a “master loot” feature is used for hard mode operations. That puts the control of loot back in the hands of the operation team/guild policy. Operations have a player set limit of 8 and 16. How is OTG going to organize raiding/endgame within SWTOR operations? I love the operation sizes. I think it will make it easier to set up operation groups. Because there is still so much we do not know about operations it is hard to describe how OTG will organize them at this time. I understand OTG has a policy about recruitment, dealing with a game’s launch date. Can you elaborate on the policy? OTG has a long standing policy to close recruiting 30 days prior to the launch date of the game and 30 days after the launch date. This gives us time to organize our current members, get them set up in the new chapter, get them guilded at launch, and have things settled after launch before we open up recruiting to new applicants. SWTOR presents us with a unique set of issues since all of our members must also join the guild on the swtor.com website in addition to our own website. We have to run two rosters and make sure they balance. If someone is looking to be a part of OTG in SWTOR how would they go about joining? If you are 25+ years old and in search of a mature guild that exists for one reason and that is to have fun, then head over to our website, check out our Code of Conduct and Guild Charter and decide for yourself. If you like what you see then create an account and head over to our Recruiting Area and fill out an application. Thanks to OTG’s very own Empire Officer, Kaeli for letting us find out more concerning the Old Timers Guild. I know that I have enjoyed my time being a part of this guild and think it will be even better in SWTOR. That’s all for this week’s Guild Checkpoint. I would love to get your comments about the article. If you would like to have your guild highlighted on CRR, please submit your guild’s name and website in an email to me at jason@corellianrun.com or let us know about your guild in our Corellian Run Radio forums. Well done and good read. See us old people know what wee are doing. Outstanding, summary of OTG! I am so blessed to have lucked up and joined this guild. Awesome article! I’m sure the rest of NONSWTOR-OTG appreciate your work on this as much as I do. I’ll also be checking Logun24x7’s YouTube Channel. Looking foward to that! @James Thanks for the comment! Logun24x7’s channel is amazing! If you want to see the real differences between SWTOR and other MMOs, check out his videos!